(C) 2012 Jon Peter van den Oever. This is an open access article distributed under the terms of the Creative Commons Attribution License 3.0 (CC-BY), which permits unrestricted use, distribution, and reproduction in any medium, provided the original author and source are credited. By the end of 2009 the Dutch Government awarded the establishment of NCB Naturalis with €30M funding. The amount is invested in three programs: Scientific Infrastructure for DNA Barcoding, Integration and Relocation of collections and Collection Digitisation. In this article we describe the highlights of the Digitisation Programme. Naturalis Biodiversity Center, the Netherlands Center for Biodiversity, was launched on 28 January 2010. The center is the result of the cooperation between Amsterdam University (Amsterdam Zoological Museum), Leiden University and Wageningen University and Research Centre (National Herbarium Netherlands) and the National Natural History Museum Naturalis in Leiden. The partners’ collections are being brought together at Naturalis BC and will be integrated into a collection totalling over 37 million objects. In terms of collection size, Naturalis BC is one of the top five natural history museums in the world. By the end of 2009 the Dutch Government awarded the establishment of (at that time) NCB Naturalis with €30M funding from the National Gas and oil profits (FES=funding economical structure (empowerment). This fund is responsible for many investments in the Cultural Heritage Sector. The amount is invested in three programs: Scientific Infrastructure for DNA Barcoding, Integration and Relocation of collections and Collection Digitisation. In this article we only describe the highlights of the Digitisation Programme. –	develop a permanent digitisation infrastructure (to ensure the remaining objects can be processed in the near future). The structure by which the digitisation has been developed at Naturalis is different from the classical approach. In the current economic crisis the challenge is to do more with less money. Therefore the solutions must contain new and innovative perspectives on digitisation. When Naturalis applied for funds, the average cost of digitisation was estimated (by experience of the past) to be approximately € 5 per object. The Dutch government granted € 13 M to digitize approximately 7 million objects (average € 1.86 per object). •	to digitise a large number of objects through an industrial approach. •	To collect only basic metadata associated with an object, which later can be amended. The Prince 2 methodology is used and the projects timeframe was first set to Q4 – 2013, which was later extended to June 2015. Project governance is carried out by the Steering Committee, overseeing scientific quality of the project. The board of directors of Naturalis BC is represented in the steering committee. Program manager, project managers and project leaders are responsible for everyday work, from the project set up to hiring staff, from housing to planning of collections to operations control, from budgeting to decision preparation and execution. The entire program consists of around 80 people. Several partner institutions (Paris, London, Finland, Berlin) were visited to define best practices. A series of pilot projects were conducted before commencing large-scale digitisation projects and selecting outsourcing partners. •	For the rest of the collection (~30, 000, 000 specimens) a high-level inventory will be created. 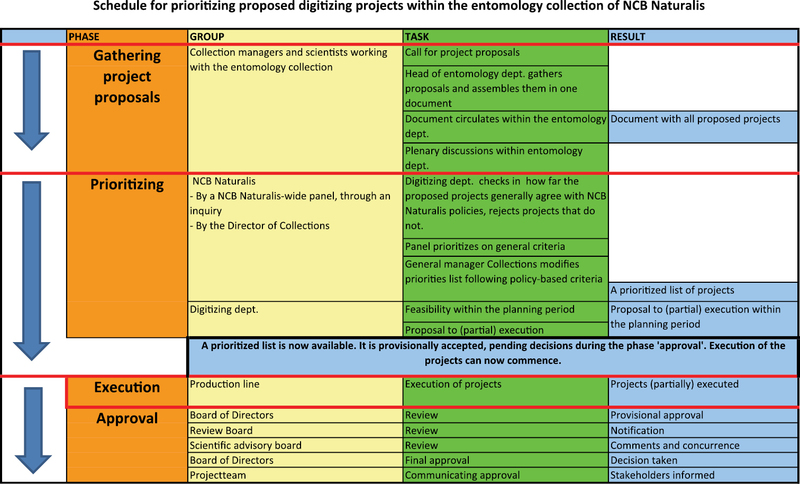 Structure of the digitization programme at Naturalis Biodiversity Center. When selecting parts of the collection for in-house detailed digitisation the most important factor was prioritisation by scientific or outreach value of the outcome (see below). Therefore, collections related to particular research or curatorial activities were identified. Value-for-money was a decisive criterion for outsourcing digitisation. Only collections for which industrial-scale digitisation technologies exist, which can be relatively safely moved to another site, and where such service is provided for reasonable price, were selected. The most obvious example of such collections is herbaria. For collections, which are not extensively used at the present, or for which mass digitisation technologies are not yet available, or too expensive, high-level inventory will be built, describing content of every drawer or lot as detailed as practical. Life cycle of Digistreets: stages of planning and executing of progect. Prioritisation of projects is a multi-step process and includes (1) prerequisites: criteria mandatory for all projects, to reject unacceptable projects; (2) soft criteria: professional opinion of panel members, to create a long list of candidate projects; and (3) hard criteria: point-base factual criteria, to weigh projects and to arrange them in order of preference. Every digistreet is developed and derived from a pilot phase. The pilot can be defined as a proof of concept of a particular project or technology. A set of success criteria is devised and agreed upon start of every pilot. A time frame between the 3 to 6 months is needed to sharpen the requirements, the workflow, object handling and to test the technology. The Mollusc and the Entomology digistreet were the first two industrialised production projects developed. The Mollusc digistreet can be visited at the Live Science Hall at the museum. An application for iPads was developed so the visitors can be involved in transcription of scanned label information. Within 9 months 17K labels were transcribed by the members of public and checked by our taxonomists. Approximately 8K label transcriptions were useful. The data will be imported in the system. The App is enhanced and web enabled and now available for the visitors at the NCB website. The idea is that in the near future every digistreet will have an App to engage the community. After the pilot phase an evaluation report is constructed for the steering committee which made a decision on viability of a larger project. Most of the pilots were transferred into digistreets. A few pilots have not been developed to full-scale projects because the technology or process didn’t meet the quality standards or requirements. An example was the 3D digitization of Bird’s specimen. The quality of the images and the 3d viewing technologies were not mature enough. ‘Digistreets’ are production lines for digitisation of objects that have a lot in common from the point of view of registration, handling, and safety regulations. Each digistreet is managed as a separate project; it has a specific location, set of tools and equipment, and a more or less tailored version of the Central Registration System. Fixed targets (scope, time, quality) and a fixed budget are set for each digistreet; and staff are provided for the duration of the project. Every digistreet staff member is fully aware of what they are supposed to process in what time at what cost and quality. An exception is the herbarium which combines the shipment of all the duplicate sheets at Wageningen and the development of two separate production lines: an outsourcing street in Leiden and a digistreet in Wageningen. 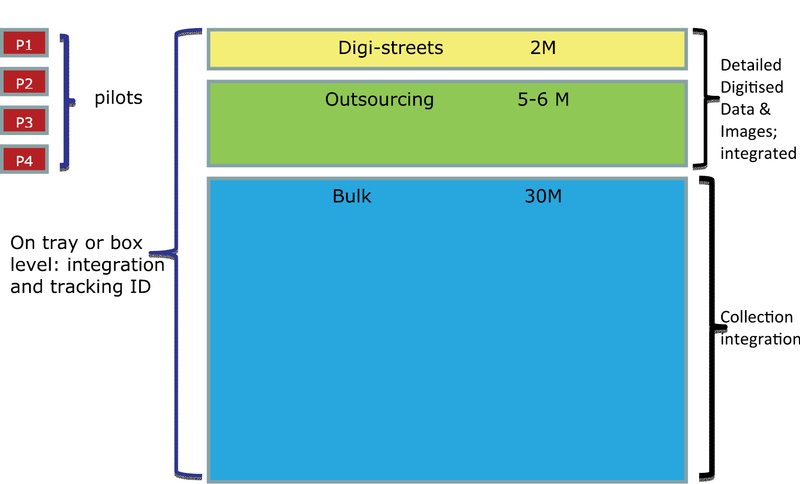 The experience of The digistreets guidelines and requirements are being applied for the outsourcing part. The acceptance of the goals of the digitisation project by the organisation is the key to successful projects. A collection manager is needed to instruct and manage the “streetworkers”. Registrators (data entry), taxonomists and teamleaders are managed by the digistreets’ projectleader. A process owner (institutionalised job role) is the leading decision maker on collections policies and priorities. He or she can oversee the individual collection requirements or the demands from the sections Collection Management, Research or Outreach. The process owner is also ultimately responsible for the safety of the staff/people or the collection objects. From the start of the programme (August 2010) until July 2012 approximately 1, 000, 000 objects have been internally digitised by a temporary staff of 80 people employed in digistreets. The outsourcing project, digital image bank and content management system are in a tendering phase and will be implemented in Q3/Q4 2012. Average costs per digitized object is provided in Table 1. •	Data is provided using the taxonomic worldwide standards (GBIF, Darwin-core) and can be accumulated, amended and used nationally and internationally.